RoundWorld Solutions was founded on the principle that surviving — in fact, thriving — in a global marketplace requires expertise and constant devotion to tracking the shifting tides and eddies of global commerce. Successful companies need an experienced guide, one who understands their requirements and knows how to achieve the desired results with maximum efficiency, while leveraging today’s global workforce. 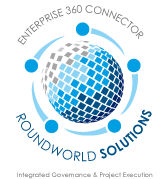 RoundWorld personifies a combination of experience and intimate knowledge of global resources, providing clients with scalable, on-demand business solutions that balance the demands of time, talent, resources, and budget in a global economic environment. CXO Tool – By utilizing the RoundWorld Solutions’ Big Data 360 degree view tool, organizations can seamlessly align their Strategic Business Initiatives, Company-Wide Programs, and Numerous Projects. This unified view results in Business Benefit Realization, Cost Savings, Metrics, and Revenue Generation. Staffing – RWS has access to local and global IT talent pool for deployment to address the short term and long term IT staffing needs of large organizations. IT Consultation – RWS leverages the expertise of its in-house IT Solutions Architects and Partners to capture, synthesize, and provide cutting edge IT solutions in enterprise, cloud and mobile domains. Software Development – RWS has partners and resources to provide software development services for customer architected IT solutions on the platform of their choice.